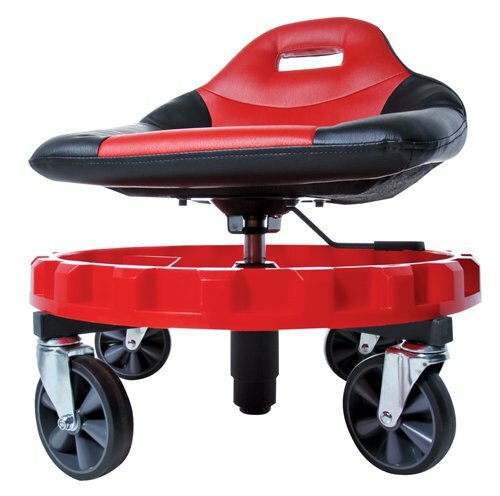 Creeper seats (or rolling stools, mechanic stools) are rolling work stools- ideal for working on vehicles or scooting around inside your home re-tiling your bathroom floor (Source). They're ideal if you want to spare your knees and lower-back the aggravation of extended, painful work postures (Source). 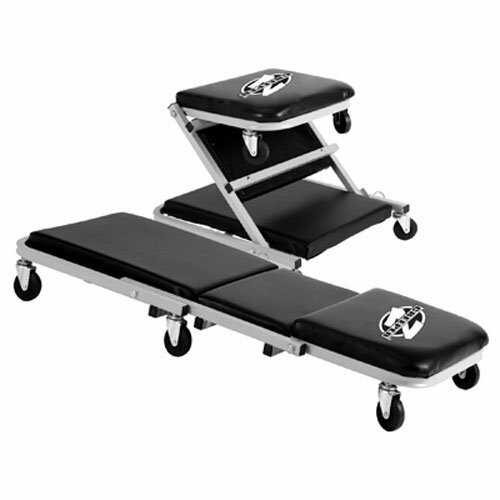 The Pro-Lift C-2036D transitions from a Z-shaped creeper seat to a padded bed. The Torin TR6300 and Wen 73011 shop stools have rear (as opposed to center) mounted seats with undercarriage tool trays. The Pro-Lift C-2800 car creeper actually converts to a short step stool. And the Traxion 2-700 mobile gear seat is a center-mounted option that includes a carry handle so you can easily lug it around with one arm. Overall, the Traxion is our top pick- from our research it has received strong support from its users and little to no complaints of mechanical breakdowns. Though you should be extra careful to tighten its screw every so often to maintain its structural integrity. The Traxion workshop stool has an outsized 400 lb. weight capacity with a spinning gear tray that keeps your tools constantly on hand. As well, the seat is height-adjustable, which is a real convenience if you are creeping around a vehicle in your garage and need to adjust from low to high profiles. The extra-large, 5" casters are built from hard synthetic rubber, helping you navigate over rougher outdoor terrain and the race-inspired, bucket seat is a comfortable space for extended sitting. Especially for those with lower-back problems. Conveniently, a carry handle is installed right into the seat so you can transport it with one hand. There have been some isolated complaints about they hydraulic cylinder depressurizing- if that happens to you, make sure to contact Traxion. They have a solid reputation and will likely remedy the problem to your satisfaction. This creeper seat offered by Pro Lift is an effective option for someone who needs a classic creeper that easily and quickly converts into a “Z” shaped mechanic’s seat. Its users love that it does a great job in both positions, but some do note that the construction is not of the highest quality. This product is a 2-in-1 creeper which is great because it can be used as a mechanic’s seat when folded in a “Z” shape or a mechanic’s creeper when unfolded. It has a heavy steel frame (450 pounds capacity) with padded seat and headers for extended comfort. Another good feature is its six swivel casters that provide full mobility and easiness of movement under the tight area. This mechanic’s rolling seat seems like a solid choice if you are looking for an efficient foldable mechanic’s creeper and creeper seat. The general user consensus concerning the Pro-Lift Z-Creeper Seat is that it moves easily. Buyers are in general satisfied with both the product when used as a creeper as well as when transformed into a seat. One happy purchaser shares that the casters are big enough to roll over breaks in the garage floor with ease. Another buyer states that this creeper provides outstanding body support. Most of the reviewers agree that this mechanic’s creeper is sturdy and well built. However, one buyer complains that the weight limitations were very incorrect, which caused one of the casters to break. Another dissatisfied purchaser says that he couldn’t fold the creeper into a chair because of the improper construction of the item. This creeper seat offered by Torin is a good option for someone who needs a mechanic’s creeper seat with a large tool tray. Its users like that it moves with ease and enables them to take a comfortable position while working, but some do complain about the difficulties with assembling and poor quality. This product is a compact mechanic’s creeper seat which is great because it provides easy storage after use. It has 360 degree smooth running casters which provide great mobility. It is constructed with heavy duty tubular steel. Another good feature is that it has a large tool tray. It comes in two colors – red and mossy oak. This mechanic’s rolling seat might be a solid choice if you are looking for a mechanic’s creeper seat which won’t take too much space in your garage. In general, users have a very high opinion of the Torin Creeper Seat, and they don’t have any complaints regarding its performance. They are satisfied with its mobility, comfortable seat, useful tool tray and find it to be a good value for money. However, one buyer complains about the low quality. He states that the paint was cracked and peeling, which uncovered rusty metal underneath. Another purchaser advises that cap nuts should be replaced by lock nuts to prevent falling off. If you are looking for a top-rated rolling mechanic’s seat with onboard storage, you might want to consider this mechanic’s roller seat offered by WEN. Its users love this knee and back saver, but some do complain about the low quality and assembling issues. 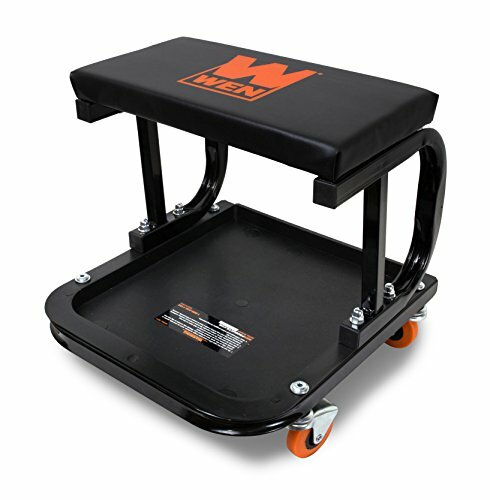 This product is a 250-pound capacity rolling automotive shop seat backed by a two-year warranty. It has a 150-square-inch storage tray, which is great because you can easily organize your tools. This mechanic’s rolling seat could be a good choice if you are looking for a rolling mechanic’s seat with a square seat and storage tray. In general, buyers are satisfied with the WEN rolling mechanic’s seat and they praise its usefulness, construction, and size. One buyer comments that it feels better to sit on it in comparison to round seats. Another satisfied purchaser finds the tool tray to be very handy. However, one buyer complains about the low quality. He says that the seat was made from very thin and weak material, which caused it to break right away. Another purchaser recommends building this rolling garage seat with stronger wheels. 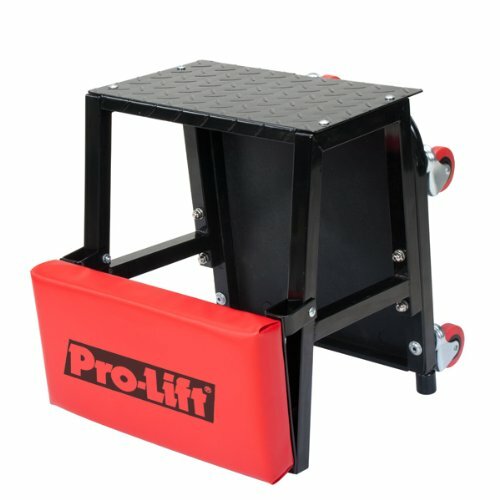 This combination of creeper seat and step stool offered by Pro Lift is a good option for those who need a greater range of access in their workshops. Its users love its versatility, but many experience problems with loose casters and several purchasers complain about instability when used as a stool. This 2-in-1 product gives extra comfort while sitting on it and allows you to reach things when stepping on it. It features 5 swivel caster which provides easy maneuverability. The tool tray provides you with convenience and a tidy workspace. If you are looking for a creeper seat and step stool combo, this might be a good pick. In general, users have a favorable opinion of this creeper seat and step stool combo, and they praise its functionality and versatility. Moreover, they like the tool tray feature. However, several purchasers are strongly dissatisfied with the casters. One of them states that casters snapped off during first use. Moreover, another buyer says that after a year and a half casters have become very loose or snapped off. Another buyer complains about the stability of the product when used as a stool. If you are looking for an adjustable creeper seat, you might want to consider this hoist creeper seat offered by Traxion. Users like its huge casters which allow you to roll over rough terrain, but many complain about the poor quality of the construction. This product has a race seat which gives extra comfort even when sitting for long periods of time. It features a built-in carry handle which allows you to carry it with one hand. If you are looking for an adjustable creeper seat with a gear seat, this might be a solid option. 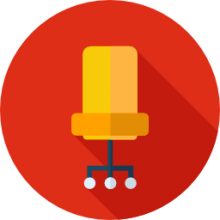 Some users have a favorable opinion of this ProGear seat, and they praise its mobility. One user states that he received a defective hydraulic cylinder, but that the customer service was great and responded promptly with replacing it. Another buyer is pleased with the backrest that this seat provides. However, a lot of buyers complains about the poor execution of the product. They state that the frame is made of weak material and that the padding is thin. Moreover, they criticize the height adjuster and loose casters. One of the first creeper seats we examined was the Pro Lift- it is unique because it is equipped to transform from a traditional creeper to an actual z-shaped seat. It features comfortable cushioning so that when you sit and scoot around you remain comfortable. It has a 300-pound weight capacity, six swiveling casters for enhanced maneuverability and the ability to change the seat with the use of a retractable pin. Buyers say that the height of the seat is about 14.5 inches and that it is height-adjustable, instead of remaining in a fixed position for a generally comfortable working height. Buyers have had mixed experiences with this creeper seat- one of them told us that he was using it while working on his car and that the wheels fell off of it after only minimal use. Other buyers concur- claiming that the caster wheels are prone to failure even though buyers were well under the 300-pound weight limit. The second garage creeper seat we examined was the Torin TR6300- it comes in either a red or a mossy oak. 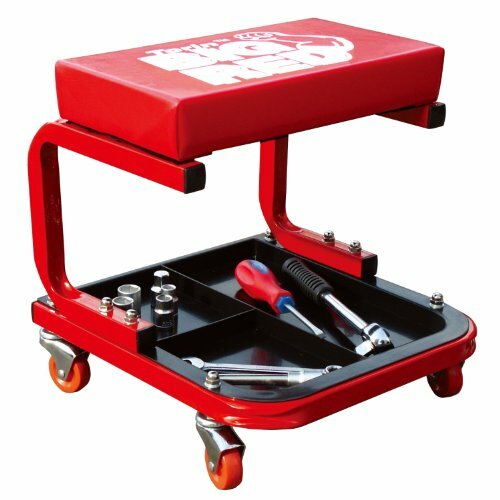 This is an especially compact option, functioning as a shop stool and mechanic roller seat, with 360° rotating casters and a large tool tray located at its base. It is advertised as a mechanic stool whose compact size enables you to easily store it in the corner of your garage or workshop, ideal for working on vehicles, especially when you need to change brake pads or tinker with your truck's exhaust system. Buyers say that it has handled users weighing in excess of 300 pounds, that it is 14.5 inches high and that the diameter of its caster wheels is between 1.75 and inches and 2 inches. An elderly carpenter says that it was ideal for a re-flooring job he performed- much more comfortable than constantly bending over or shuffling around painfully on his knees (rolling knee pads can help with this!). Another reviewer endorsed the floor creeper as a solid value buy- an inexpensive, well-constructed option with smoothly rolling wheels and a convenient tool tray. Another reviewer who owns a fleet of cars and is in the habit of employing a dual action polisher on them says that purchasing one of these creepers seats has made his life much easier. This mechanic creeper work stool means he doesn't have to bend over and can scoot around the perimeter of his car and give it a good polish. In terms of assembly, all you have to do is connect with the U-bar to the creeper seat and it's roller- this generally takes under 15 minutes. The third option we looked at was the Wen rolling mechanics seat- it features a vinyl-covered cushioning that is marketed as highly absorbent and thick, with 4 swivel casters that move 360°. It is equipped to handle users weighing up to 250 pounds and its included 150 in.² tool tray is designed to hold small power tools, bolts, pliers, screws and any other workshop items you need to roll around with if you are working on a car in your driveway or performing indoor home repairs like carpet removal, tile jobs or demolition projects. For the most part, buyers were satisfied with this option, with one reviewer saying he preferred the layout and configuration of this mechanic creeper stool because those that are designed to be supported in the middle, in his experience, often breakdown. The fourth option we examined was the Pro-Lift C-2800. It has a 300-pound weight capacity, 4 swiveling casters, and is engineered to transform from a traditional creeper seat into a step-stool. When converted to a step stool, the step has a size of 14" x 9", while the seat size of the creeper is 14" x 7 7/8". When it is deployed and step mode, it is 16.5 inches tall- with buyers advising that you make sure that you tighten the casters before utilizing as a stepstool in the case that the manufacturers haven't tightened them enough. Indeed one home repair expert we spoke to told us that when assembling, he decided to utilize some additional hardware to replace the flimsy screws that shipped with the item to make it sturdier to use. The last mobile mechanic's stool we examined was manufactured by Traxion- that includes a gear tray, height adjustability, 5-inch casters manufactured from TPR synthetic rubber, a carry handle installed in the seat itself, and a race-inspired cushioned seat engineered for comfortable and extended use. Buyers advise new users to make sure that all the screws are completely tightened- perhaps even using a thread locker to ensure that it doesn't break down as you roll around on it. Buyers were also impressed by it's 400-pound weight capacity. One reviewer we spoke with two separate from significant lower back injuries, having undergone a spinal fusion and lumbar discectomy, says that purchasing a mechanic creeper seat was one of the best decisions of his wife, sparing him from aggravating his lower back problems.